I will like to share my latest Poljot addition, a 1987 Штурманские/Sturmanskie also know as the Navigator. The Штурманские has a long history in Soviet horology. On April 12, 1961, Yuri Gagarin, the first man to travel to outer space, wearing the first version of the Штурманские for the world first space mission. Штурманские was an issued watch for pilots graduating from the Orenburg Military Flight School. Front, very good condition, a stainless steel Штурманские. It looks and feels so much better than the chrome version. Zooming into the chrono bridge, 31659 caliber, SN: 0877, 2nd quarter of 1987. I'm pairing it with a green nato for today and tomorrow. A side by side comparison with a civilian chromed version of 3133 non-hacking Штурманские. The 31659 is the 3133 caliber with hacking function, the additional part circled below. An extract from Poljot on the chronograph 3133 . Translated by Google. Development is made by designers, technologists and designers of the plant. In developing a mechanism has been given special attention to reliability, manufacturability and maintainability mechanisms. In 1976 the plant began production of new wristwatches with sekundomernym device: chronograph model 3133. For this development team of designers the 1st MWF was awarded the State Prize. Originally watches were intended for officers of the Navy and were called "Ocean" (item 731). Later produced a modification to the Air Force crews called Sturmanskie "(model 31659, watch with second hand and arretiruemoy pointer lap time) and watch" Sturmanskie "with a pointer to a lap time (model 3133). Issuance of all these models produced in limited quantities from the military office. Only nine years later, in 1983, the clock mechanism 3133 became available to ordinary customers. Watch "Flight" 3133 took with them the astronauts into space by Russia, France, Germany, Ukraine, and together with VV Polyakov, this chronograph set the record for the duration of space flight. Thanks for posting and thanks for sharing your photos of your watches. Welcome to the Forum. I like those Штурманские watches a great deal - Jon' has a very similar watch. Great to see you here Roo. Your 31659 is one of the best I have seen and it is interesting to see it next to the non-hacking 3133 version with inner rotating dial. Some say that the 3133 version was also used by the BBC but there is no doubt that the hacking 31659 was Air Force only. The 3133 is a Russian copy of the Valjoux 7734 - the Soviets did not buy the tooling for the 7734 as is often suggested - parts of the movement are similar but not interchangeable. It is becoming hard to find them in good condition like yours - usually the dials and lume are very poor. One which had been relumed (and not particuarly well) by its owner recently sold for £350. They are very underrated but that seems to be changing fast. They are quite heavy watches, particularly when compared with their Western equivalents - Seiko Generation 1 and 2, Adanac etc. Whilst the West switched to cheap quartz watches for their pilots the Soviets were loyal to their mechanicals. Why? Cost? No, it was partly a matter of discipline -the Russian view was that the daily task of winding a watch was particularly important for the cosmonauts (see below). Equally, it was partly quality, the 3133 is considered by many to be superior to the 7734 - the Soviets often spent huge resources on their military equipment - take the Sukhoi aerobatic aircraft for example, designed by the Russian military with a limitless budget to be the best civilian aerobatic aircraft in the world - it won everything. I have three of these which are currently being serviced. There are slight dial variations, early ones seem to have the different sections in the chrono sub-dials in a lighter shade of grey - like yours - then some have those sections in white, whilst on others the dial is more grey as opposed to blue grey - it's not until you start trying different Natos that the subtle differences become clearly apparent. The logo on the dial and on the caseback is the badge of the Soviet Air Force, the BBC. What I like about these 31659s is that they were also issued to cosmonauts. 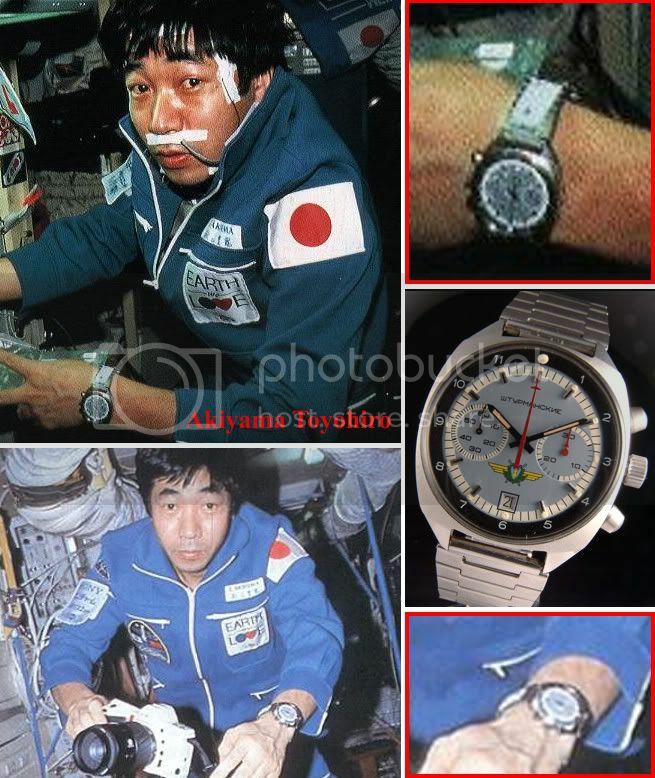 It is well documented that they were worn in space, for example the first space tourist Japanese journo'-cosmonaut Akiyama Toyohiro wore one in 1990, so I guess you could say my 1990 example is a kind of poor man's '69 Speedie? When mine are back I will post some photos and more information. I look forward to seeing more of your watches, particularly your Czech issued Pobeda...! Once again, great to see you at ATG and I hope you become a regular on NSN 6645. Last edited by StampeSV4; 14-11-2009 at 16:25. New member here. I joined this site while researching my watch. It's the same as the 31659 on this page. 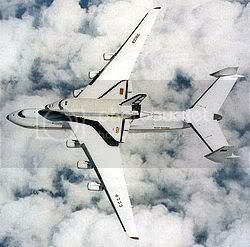 Mine was given to me in the late 90's by a test pilot who I used to be related to via marriage. Our wives were sisters but since my divorce over ten years ago I haven't spoken with him. Anyway the watch is engraved on the back welcoming Igor Votintsev to Sukhoi on his maiden flight. I'll get some pictures up if you're interested. I did replace the crystal a few years ago as it had gotten cracked. The newer one has a crack in it too now. I know I should have looked after it better... Also it's stopped working but the old guy in the watch repair shop who changed the crystal for me previously says it's not so big a fix. Quoted me $120 to do it. It's been a few months since I inquired about that and I forget exactly what he said needing fixing. One question. How do I get the back off? I'm not watch savvy. Last edited by Gov'ner; 16-12-2011 at 06:37. That's a really interesting one, with the inscription and provenance - very nice gift and $120 to put it right isn't too much in the big scheme of things as your guy says. If you look at Roos second picture you'll see that the case back is held on by a retaining collar/ring; this has indentations on it to be gripped by a tool and unscrewed - that's how you get the back off. I'd recommend getting this done by a watchmaker who would have the necessary bit of kit, as otherwise you may mark up an otherwise interesting case back. Last edited by andy_s; 16-12-2011 at 12:34. I appreciate the warning in messing the back up. I'll leave it well alone now. I was just going to a put a picture of the insides up is all. Here's why I started researching the watch. I've been playing guitar for around four years now. My guitar is a piece of junk although it's served me well. I'm just more than ready to move on up to a fairly decent guitar so I got together a bunch of things I don't need or use anymore that I could sell or trade towards my goal as good guitars are expensive. I've read the rules on this site about new members only joining up to sell so I won't be doing that here. I don't suppose you'd have any idea about what ball park value I should be looking at? Mine which has the metal strap, box and papers is for sale for £450 on the sales forum. Over the years I haven't wanted to sell it because it meant something to me but watches aren't my passion, guitars are and I'm in need a decent guitar. I guess I'm looking more for a space/aviation collector than a watch collector?